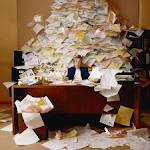 As Certified Professional Organizers we are asked to come into homes and offices to help with the clutter that has just gotten out of control. Clutter that has taken over the space and soon to be the person’s life. Something that I did not foresee was the need my clients have when it comes to the “clutter” in their financial worlds. In the past two years I have noticed that there have been more and more clients asking for help to “organize” their finances. They have told me that they feel trapped, suffocated and buried alive when looking at the numbers. All of these feelings were old hat to me, but this new desire to ask for help to de-clutter their financial woes was new. We have always come highly recommended when people are looking for help in offices and businesses. The team from Just In Time Solutions has an amazing organizer, Erin Playford who is very good at streamlining and taking a step back and seeing where the holes are in existing processes. But, these new enquiries weren’t asking for the systems that we use to keep an office or business running smoothly, they were asking for help to get out from the mountain of debt. We are not specialist in this field. We are learning with the best of them, however the fact that we have the experience and knowledge to look outside the problem and analyze it helps in this growing field. In extreme cases, I would always recommend a client seek help from a financial planner, or debt solutions expert. But we have had a few clients who we’ve managed to help sort through the rubble and get them on track to financial stability. Mainly our goal was to get everything out in the open, look at the money going out and what was coming in. Budget for the absolute necessities. Taking those things right off the top of our income and seeing what’s left. One rule we’ve learned from our research is, after you’ve covered the necessities, start paying off the highest interest owed loan. You WILL NEVER get out from under the stress of financial debt if you’re just making “Minimum payments”. If a client has more then one credit card or outstanding loans, again we recommend they speak to a Certified Debt Solutions professional. From there, what we recommended to our clients was go to a cash budget. No more CARDS, they are so easy to be taken advantage of. So go old school or go home! We set out pencil cases for one client and labeled them according to what she needed weekly. You see we still wanted our client to live a life she was comfortable with, meaning she still wanted to get her hair done and have a cleaner help her with her home. But we did get her to realize that she only needed to get her hair done once a month and the cleaners could come bi-weekly. Just pointing out the savings from those two decisions gave our client the incentive to go further! Once a week (Same day – every week) our client goes INTO her bank. Says good morning to an actual teller and hands her a list of the money and the denominations she is looking for. The teller ( who by now knows exactly what is needed) smiles and encourages our client as she puts each amount of cash into the appropriate case. One thing that made this easier on us was the fact that our client was on board and “hard on herself” – she wanted the stress of no money at the end of the month to be gone! Once her case was empty, that was it! She didn’t have any more money to spend – no if, ands or buts about it! Are we financial wizards? No. But with a little “outside” help our client has managed to pay off her credit card in six months. And is diligently working on her line of credit. One thing we’ve learned from this particular client is once you’ve set up a system and they see results from their daily due diligence they will take the challenge even farther. This particular client surprised us at the end of 6 months with a “cash jar”. The extra money that she had saved from her weekly cases! She had wanted a bicycle, so anything she hadn’t spent, she tucked away and at the end of the 6 months she had proved to herself and us that given the right path she could surpass her goals! Please check all that apply and keep receipts and information with checklist. Has the Paper Tsunami come through your office? Quick get the RAFT – READ ACTION FILE TOSS – Rob and Kim did! Do you feel like you are constantly searching through piles to find what you need? Do you come in at the start of the day and wonder where to start? If you are taking hours to go through paper and emails and never really accomplishing anything, NOW is the time to start organizing so your business can move forward. Take all your piles of papers and put in a box. Go to a sorting table. Next every paper is one of these – TO BE READ – TO ACTION – TO FILE – make 3 piles and have one box for recycle and one for shred. If you have a shredder, shred as you go. Keep in your head as you go through Read, Action, File, Toss – RAFT. You can use the same system for Email. Once this is done you need to make a home for the READ and ACTION – this you can use a 3 tray system or a desk top system. Everything that needs to be filed you need to categorize and make file folders, hanging files and put in filing cabinet. From here purge and organize your drawers, shelving units and anything else that needs to be done. Make sure everything has a home, pen holder, clip holders, containers to hold ink cartridges ( new and old to recycle), CD’s, books, extra office supplies, paper etc. At the end of the day, put everything away, action for the next day goes in the ACTION tray – end your day with a clear desk so when you come in the next day you are starting with a new slate. DON’T SET IT DOWN, PUT IT AWAY! This is an article featuring myself. How well are your computer files organized? Are you able to find the documents you need when you need them?